The American Heart Association BLS for Healthcare Providers skills session is the hands-on portion of the AHA Blended Learning course HeartCode BLS and includes skills the practice and testing components. It is conducted in-person after a student completes the HeartCode BLS Online course (sold separately). The Heartcode BLS online course is approximately 1.75 hours in length. Click here to purchase and complete HeartCode BLS Blended Learning Course on the AHA website. Participants must complete the online course, print out the completion certificate and bring it to the skills session class. 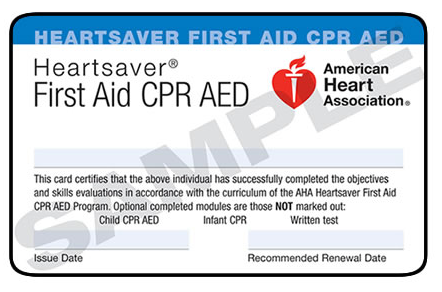 Upon successful completion of the skills session, participants will receive the American Heart Association BLS Provider Certification Card. We can provide this course on-site at your home or workplace. If you have a group of 5 or more people, discounted pricing is available. Please call us or fill out the form on the Contact page for more information or to set up training at your location. Upper Valley CPR is an American Heart Association Certified source for CPR and First Aid classes and certification. We offer Heartsaver CPR/AED and First Aid and Basic Life Support (BLS) classes and certification. We are affiliated with Dartmouth Hitchcock Hospital as our AHA training center. We come to your facility to train your staff in any combination of First Aid or CPR AED from the American Heart Association at a time that is convenient for you. We are available any time: day, evening, or weekends and travel throughout the Upper Valley area including Lebanon, Hanover, Norwich, White River Junction and throughout the Upper Valley of Vermont and New Hampshire.